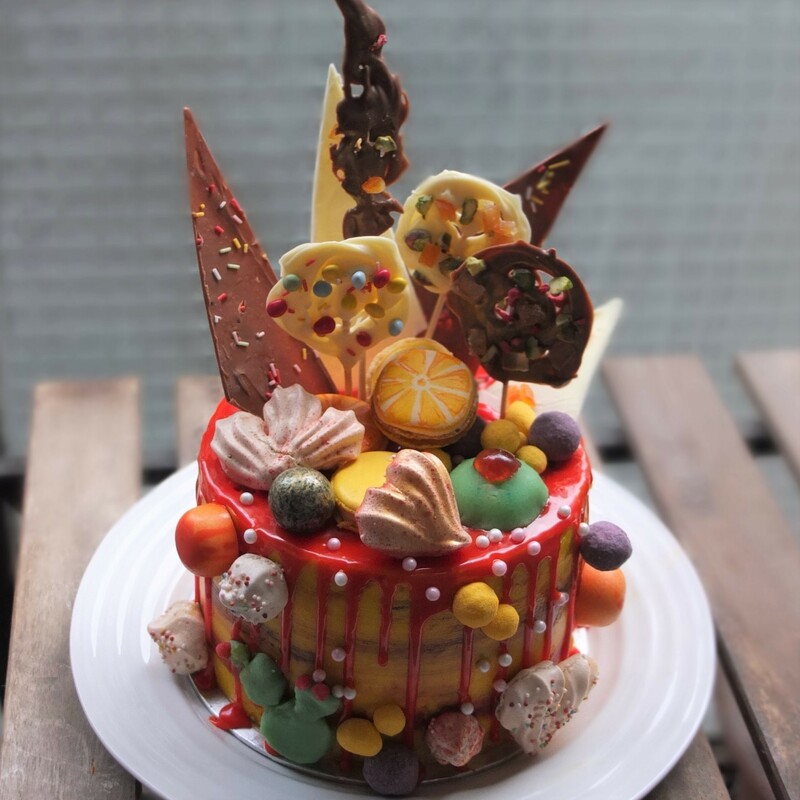 In 2015 drip cakes were popularised by bakers like the colourfully creative Katherine Sabbath – see her instagram account here. And have a look at Christian Escribà’s creations at his IG account here. 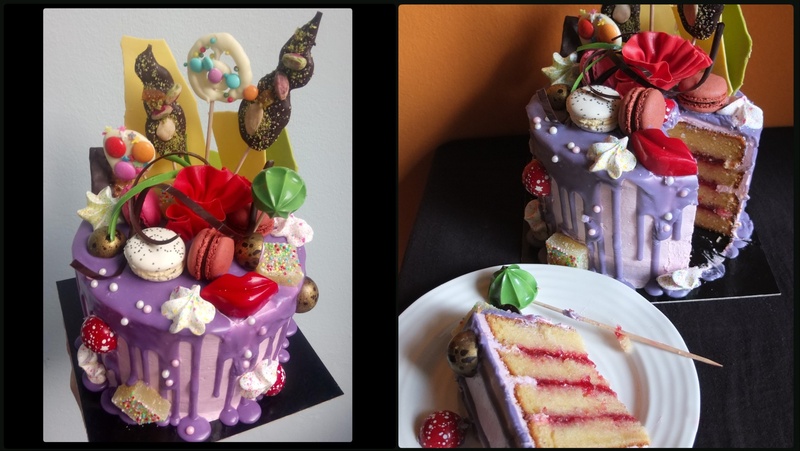 If you’re in Barcelona you can do the drip cake or other workshops at the Escribà Academy. Our chef was very clear and patient with us. 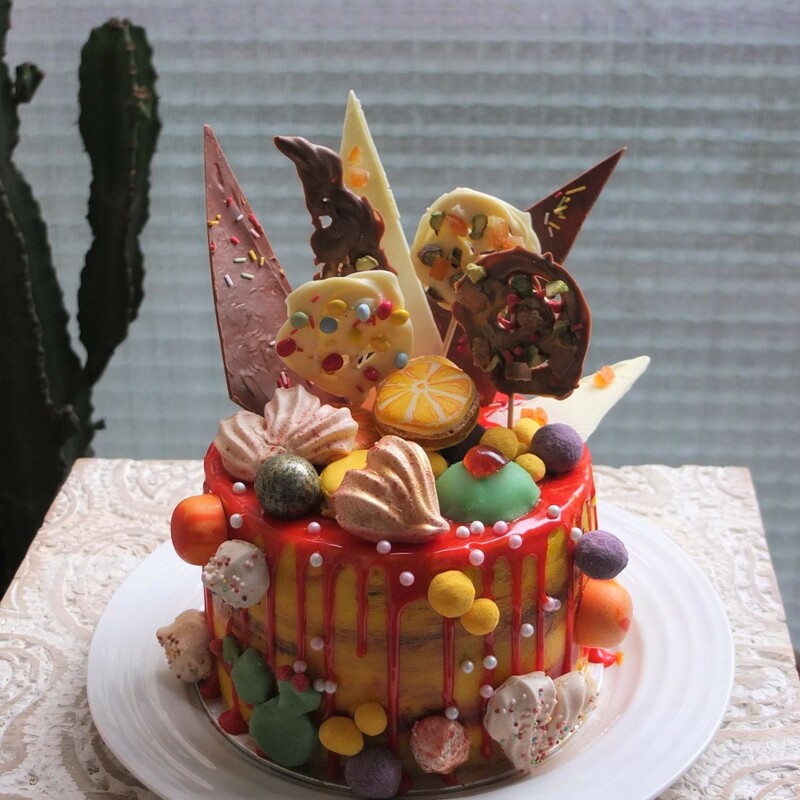 Here’s the surprisingly delicious, slightly messy but fun drip cake I made. 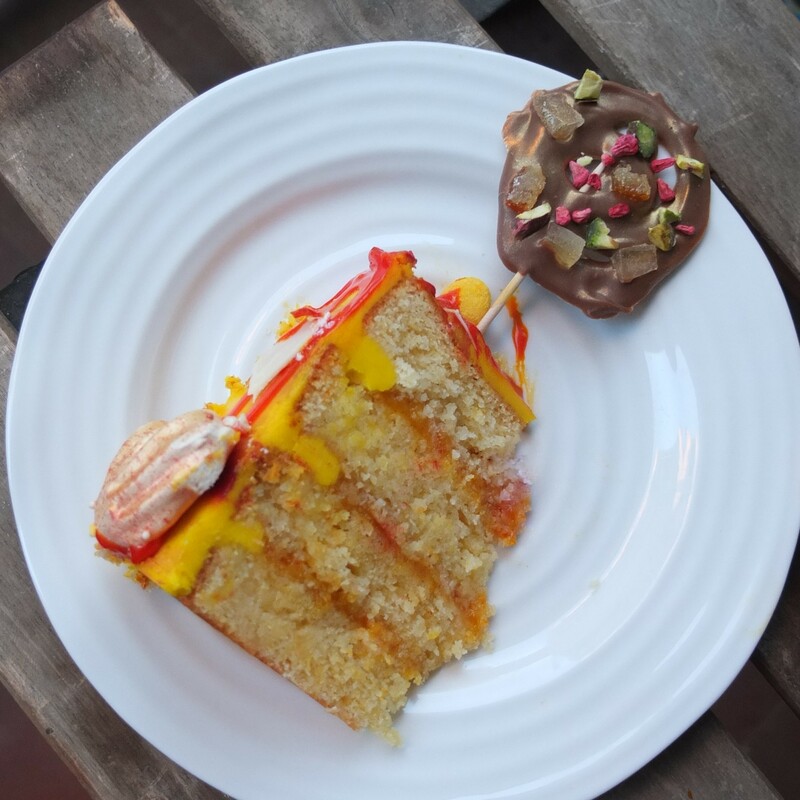 For this Sicily-inspired cake I’ve adapted my own recipes to make the various elements. The red drip glaze was suggested by the instructor – it has lots of glucose so it’s shiny but a bit sticky to work with. So instead the recipe below is for a glaze with just white chocolate and cream. It’s more commonly used and you can see it above on my mauve and pink cake made at the course. DECORATIVE ELEMENTS – make a selection in advance with 3 sizes: tall, medium-sized and small. Or buy in a pâtisserie! 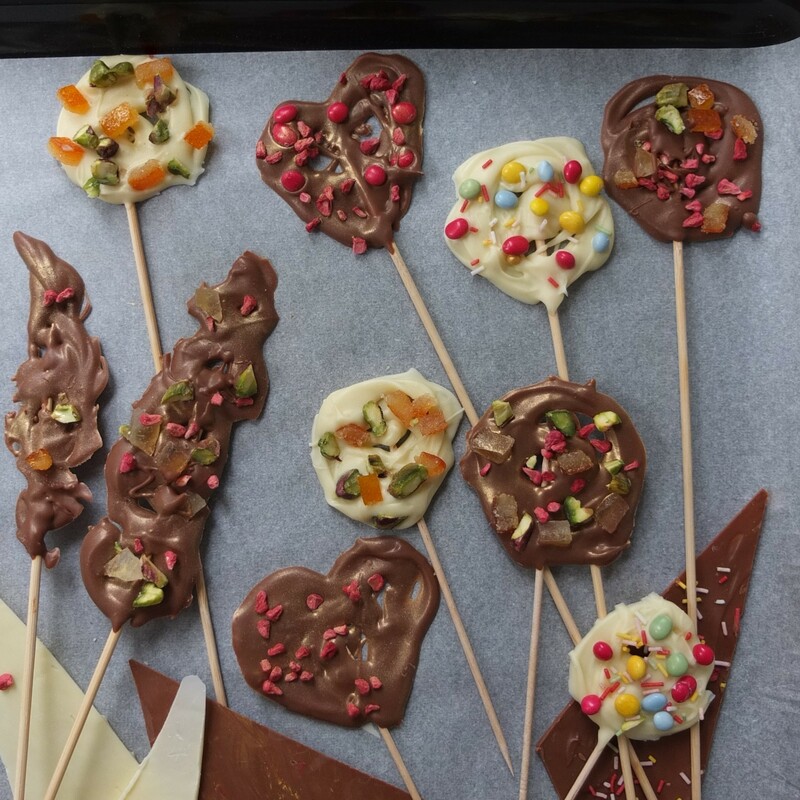 Chocolate lollipops and shards: for instructions see my post Chocolate lollipops, shards and the miracle of easy tempering with mycryo cocoa butter! 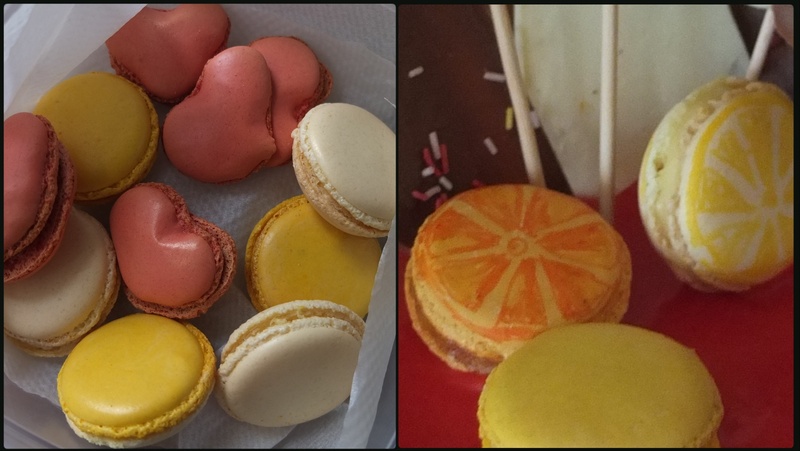 Macarons: you can follow my Italian meringue macaron shells recipe (half quantities) and make different colours and sizes so you can freeze some for your next cakes! I drew orange and lemon slices on a few with edible food pens. The fillings are: ricotta beaten with lemon juice and lemon cream; mandarin compote with jam. Meringue: to make little meringue swirls and kisses follow my meringue recipe (half or quarter quantities) or use your own recipe. Sprinkle with edible glitter or tiny colourful balls just before baking. Once baked you can spray with edible gold glitter. Marzipan stuff: shape a green cactus with red prickly pears and a cassatina (fill with ricotta and top with half a glaçé cherry). 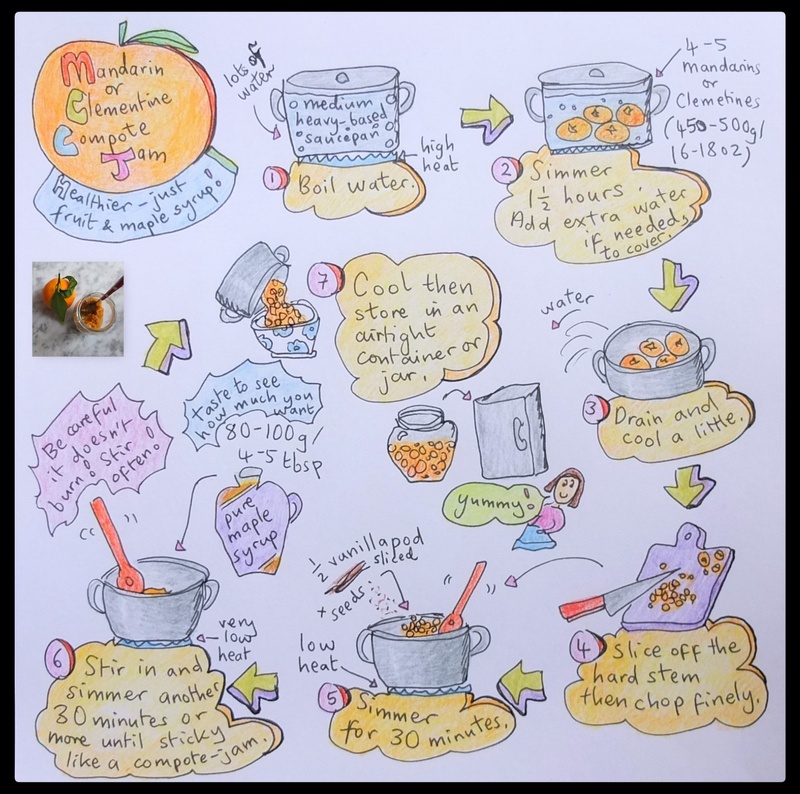 JAM – use good-quality homemade or shop-bought: mandarin, orange or raspberry. They’re all great with lemon. This cake has a combo of jams from Sicily (mandarin and blood orange) with homemade healthier mandarin compote. Pass everything through a sieve (some compote doesn’t get through so save for later to eat with cheese). You need a little more than 250g/8.8oz citrus jam. SPONGE – make the day before. The quantities are for two 15.2mm/6in diametre and 76mm/3in high round baking tins – 50mm/2in could also be high enough. It’s the lemon sponge from my Lemon drizzle and raspberry cake but the flour’s replaced with Doves Farm gluten-free self-raising flour plus 1/2 teaspoon glutenfree baking powder. Baking time’s around 25 – 35 minutes (depending on your oven). Bring the water, juice and sugar to the boil in a small saucepan then pour into a small bowl to cool. If using limoncello stir in after 5 minutes. 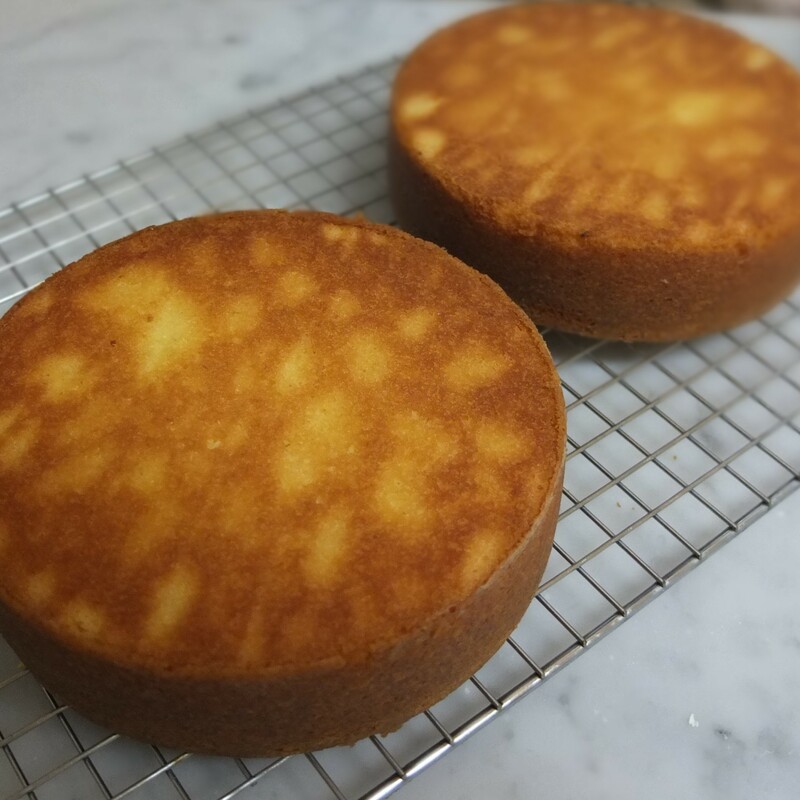 Position your cakes on top of each other – with the flat bottom of one cake underneath and the flat bottom of the other (upside-down) cake on top. 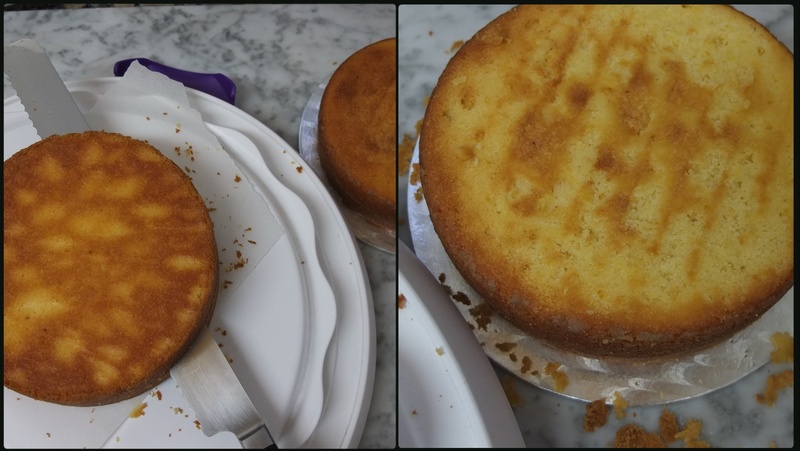 With your finger and a little flour (or icing sugar) make a vertical line up the side of the cake so you can remember how your layers are positioned. 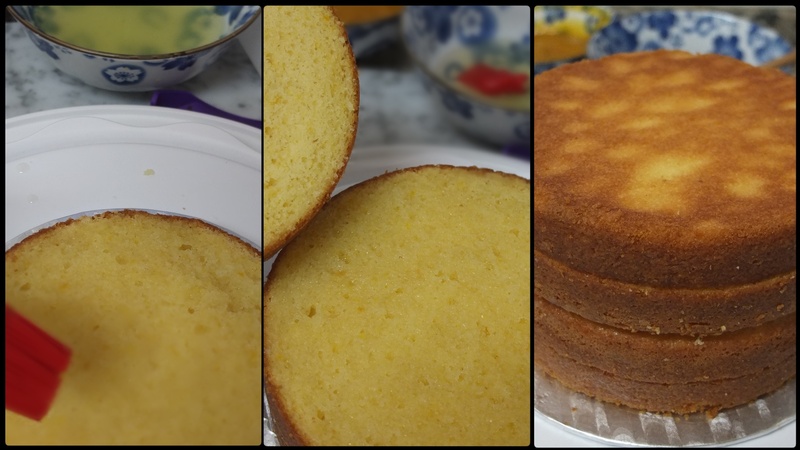 Slice the two sponges horizontally in half with a serrated knife to make 4 even sponge layers (slice a very little off both tops so the lemon syrup can be better absorbed). Reposition your layers and with a fine grater go around the sides and grate a little to make a smooth surface all around. Make that line with the flour or icing sugar again. 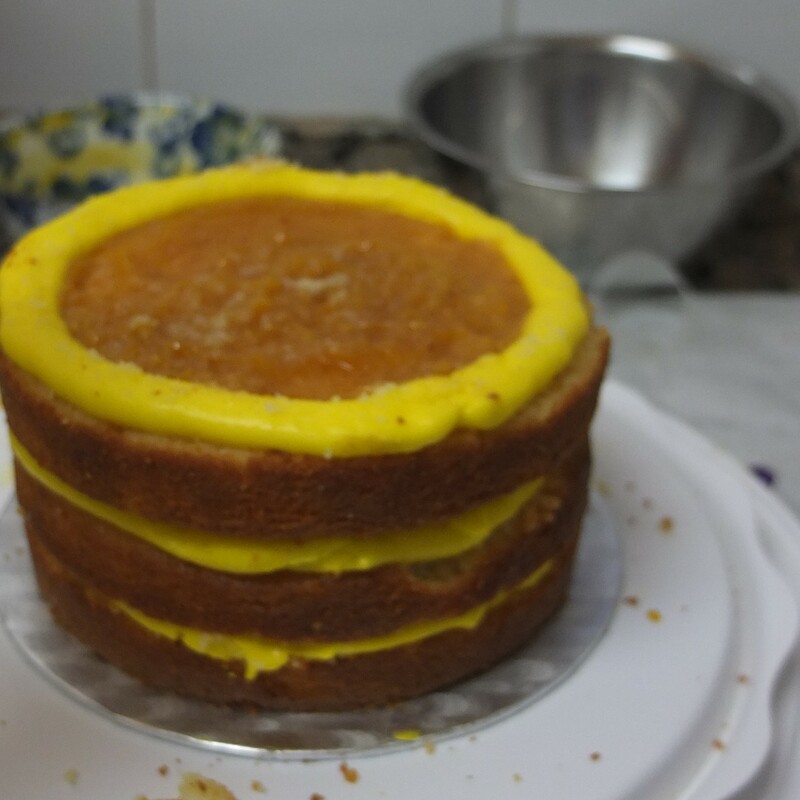 Soak the bottom layer with the cooled lemon syrup by brushing all over the surface once or twice with a pastry brush (to taste). Repeat with the two next layers. For the top layer turn upside down to brush the open ‘non-crust’ side. 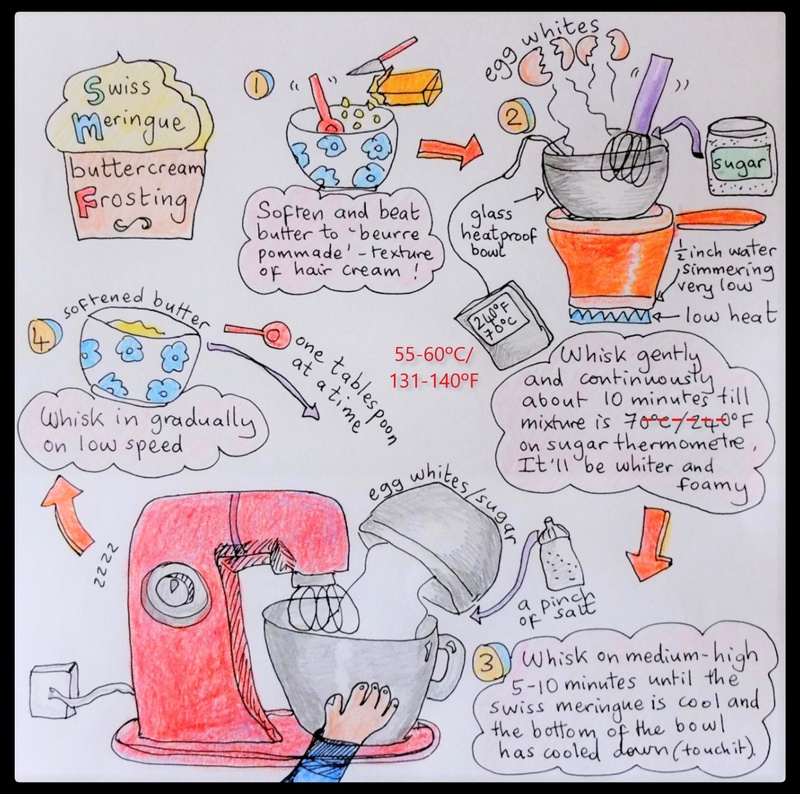 Swiss meringue buttercream – it has a very high quantity of sugar and butter to egg white, which probably makes it easier to spread but you could look into recipes using more egg white. It can work well and is delicious if your butter’s top-quality and the frosting’s thin. 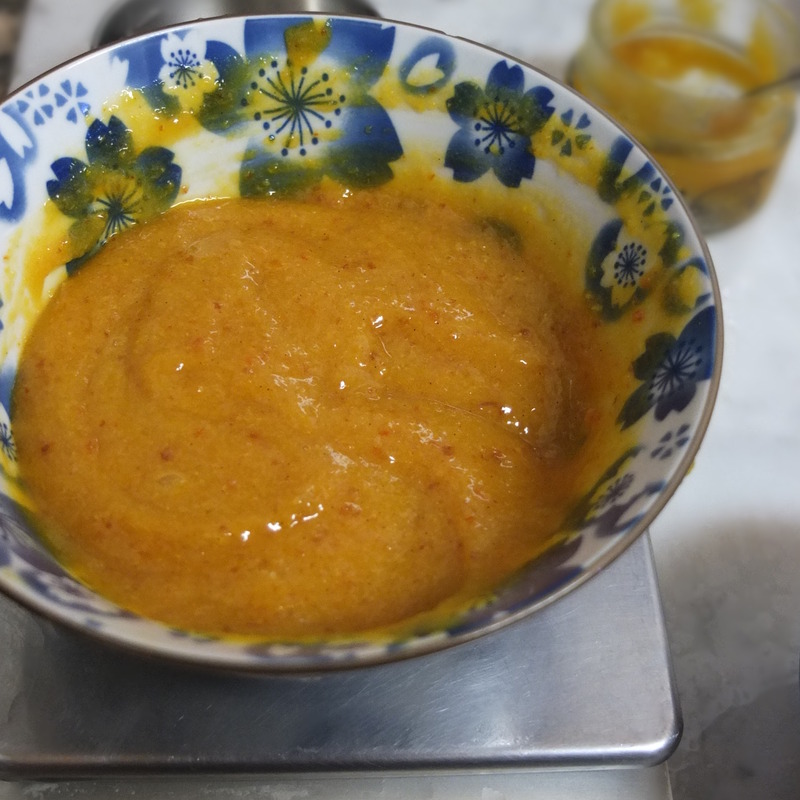 Follow the recipe below, heating to 55-60ºC/131-140ºF. When you rub some mixture between your forefinger and thumb it shouldn’t feel grainy. 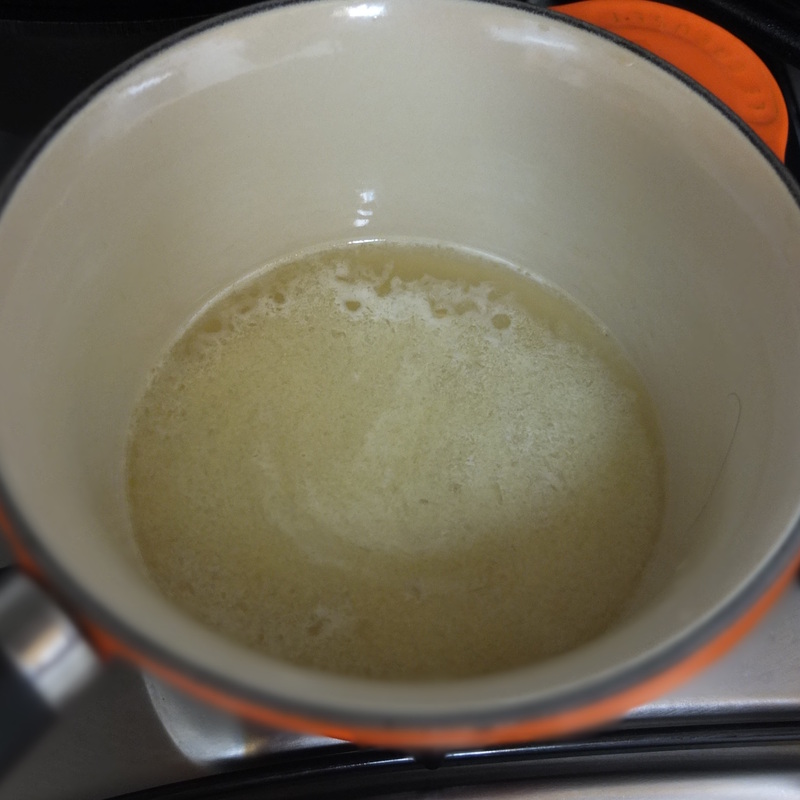 After you’ve added the butter don’t worry if the mixture looks curdled or separated. 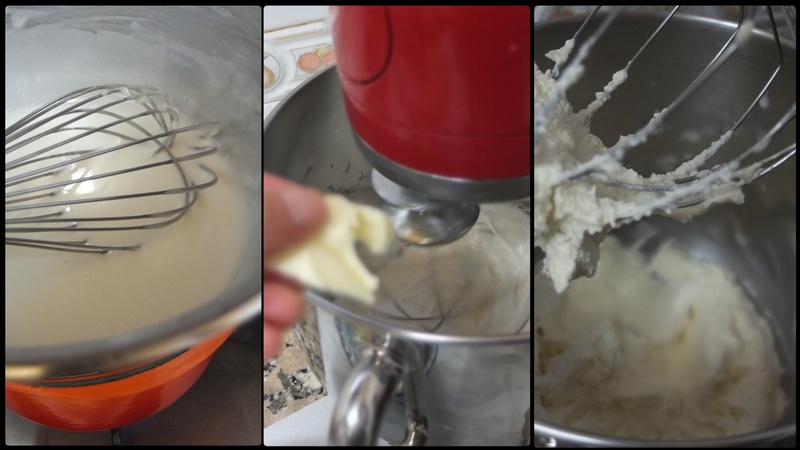 Keep whisking until it becomes smooth or try heating it quickly over the stove while hand whisking. Add the colouring when the meringue has cooled a little and continue to whisk. Add a little at a time so you don’t get a strangely violent colour. Lol. A little red could have made it a nice orange…? Fill a disposable piping bag with the buttercream and cut a small-medium hole at the tip. Pipe a little blob of buttercream on your plate or cake base then put your bottom sponge layer on this. Pipe a circle of buttercream around the edge of the sponge, fill the middle with jam and smooth with the back of a metal spoon or small offset spatula. Place the next sponge layer on top, connecting the vertical line of flour/icing sugar. Repeat to cover this second sponge layer and the third. Add the final top sponge layer. Go straight to icing or do a thin ‘crumb layer’ and refrigerate 30 minutes first. You could watch this great How to ice and smooth a cake with swiss meringue buttercream youtube video. It’s really clear and shows how important patience is. Keep going round with your scraper (a plastic pastry scraper is great) at a 45º angle – your frosting can become smooth! Luckily it doesn’t have to be perfect for a drip cake and you can stick sweeties on dodgy patches. Hurray! To first put icing on the cake you can spread with an offset spatula as in the video or you can pipe like I did, starting from the bottom and going upwards. 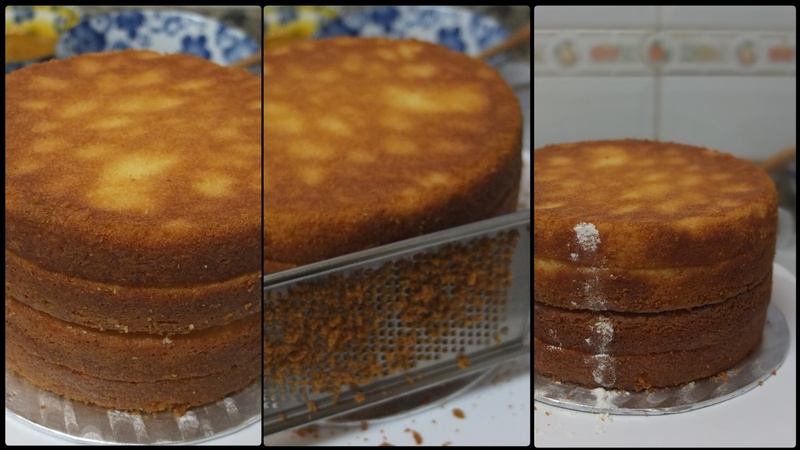 If there are holes fill with little blobs of buttercream then go around with the scraper. After doing the sides spread some across the top. Then go back to even the sides. Smooth the top edges as in the video by drawing the edges in towards yourself and the centre of the cake. My main problem was the yukky yellow. I tried adding gold and red powders as I went around with my scraper. 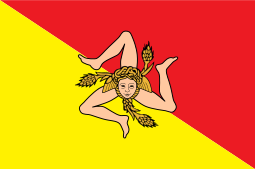 Actually the Sicilian flag is red and yellow. 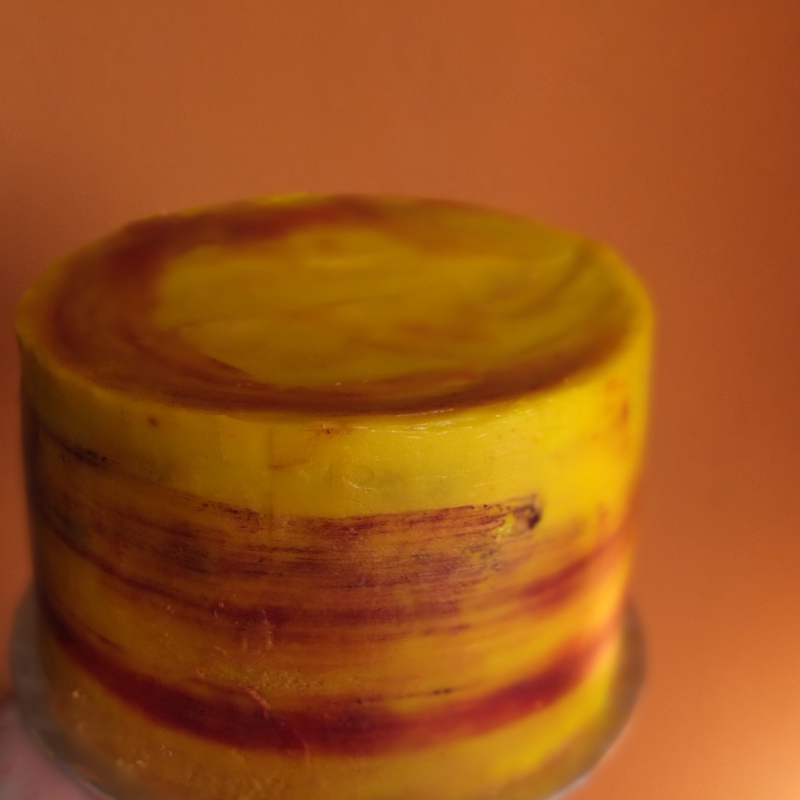 I could have left it like that, a kind of abstract art cake. But I was determined to drip. Lol. 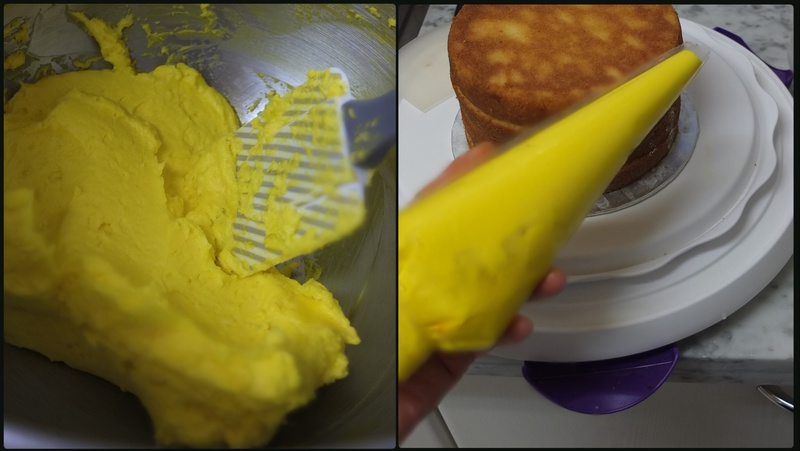 Put your cake in the fridge about 1 hour for the frosting to harden then you can smooth it again if needed. Now for the drip. 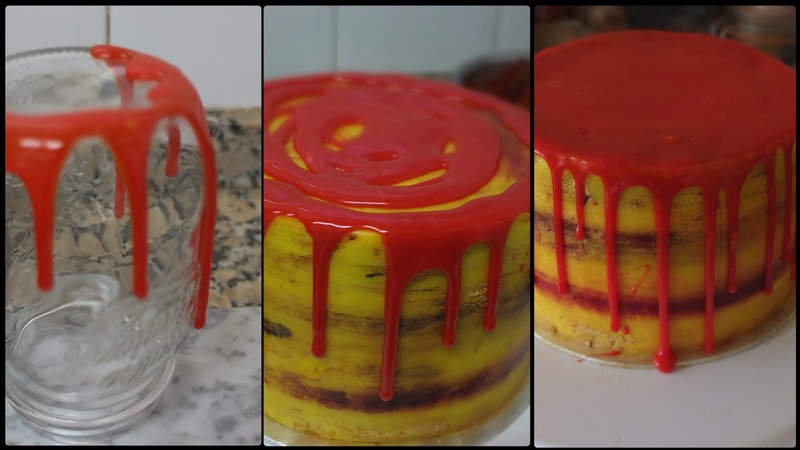 There are great step by step photos on how to achieve the drip effect with a spoon in The perfect white chocolate ganache drip cake recipe at the World of Anges. 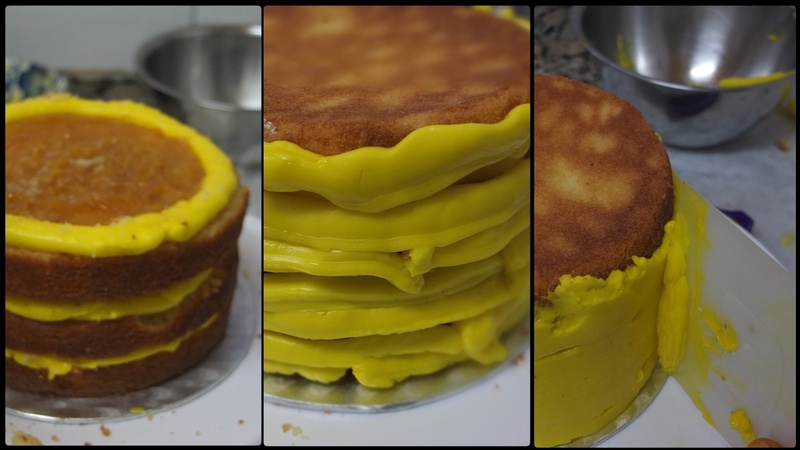 I used a similar method but with a disposable piping bag to pipe little blobs at the top edge of the cake that drip down (still need to practise and control the pressure so less of them hit the bottom). Put the chocolate (in small pieces or drops) in a medium-sized metal or glass bowl. Bring the cream just to the boil in a small saucepan. Immediately pour over the chocolate. Let the chocolate melt a few seconds then whisk vigorously to make a shiny ganache. Warm a little if necessary to melt the chocolate completely. Add a very little colouring powder or gel at first then mix well. Repeat to achieve desired colour. Wait until your drip glaze is a good consistency and around room temperature (28ºC). Practise with a spoon or piping bag on an upside-down glass. The drips should run down but not hit the table (wait 5 minutes to check). If they’re running fast wait for the glaze to cool and thicken a little. If the glaze is too thick and going nowhere warm it a few seconds. When confident do the drip on your cake. Again be careful to do small drips as they keep running down a while!!! If they hit the base don’t worry – it’s a drip-cake style. Smooth some glaze thinly on top (careful not to push some down the sides). Start with big elements like lollipops then stick in shards (via a pointy end) behind them as a backdrop. Put the macarons in front. 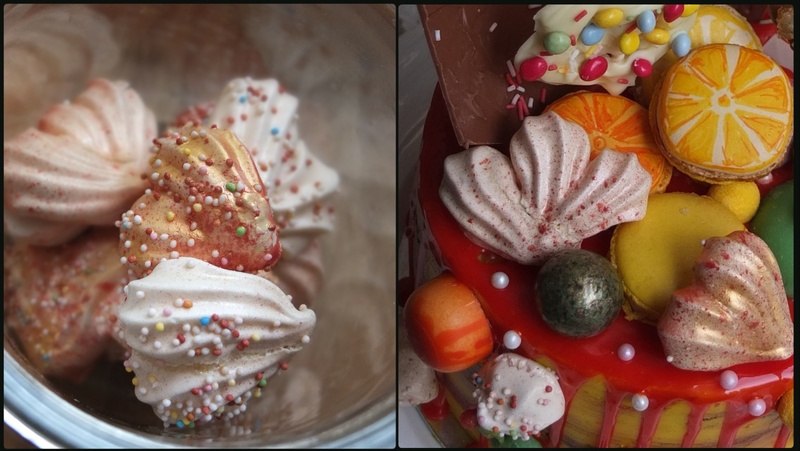 Add other elements, with little meringues and sweeties also going down the sides and at the bottom. Use a small toothpick to insert into a sweet or chocolate then stick the other end in the cake so it doesn’t slide down. I went a bit crazy. I think I should put less stuff next time. Anyway it’s personal preference so do arrange things artistically to your taste. This was definitely a challenge for me. 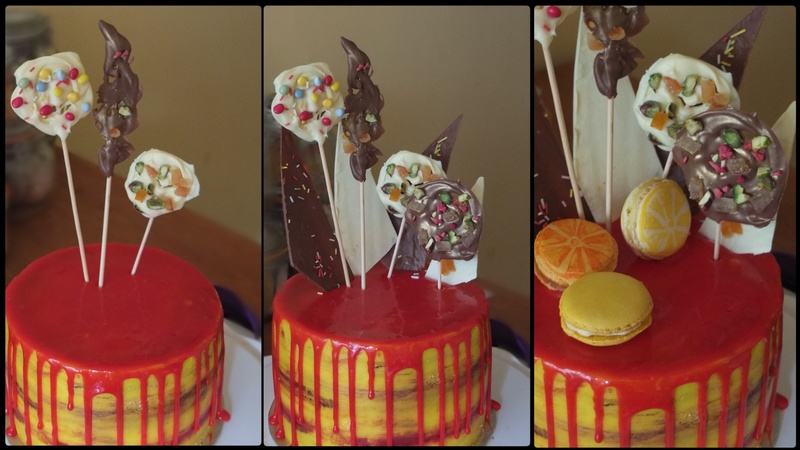 But the elements and sponge are made in advance so a drip cake’s actually great for special occasions. 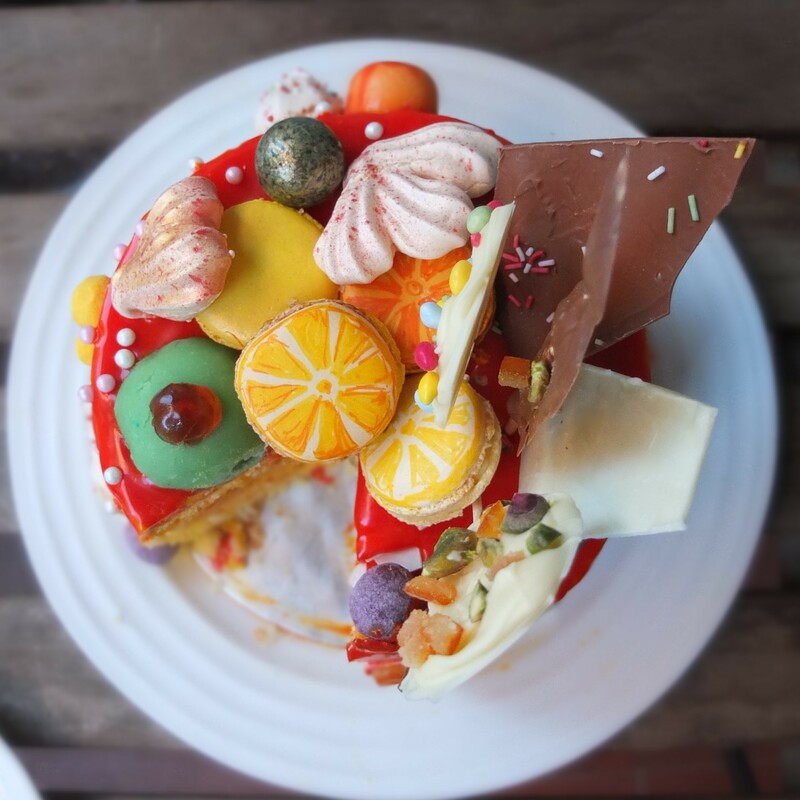 It’s all very exciting, especially since I love colours and it’s so decadent and yummy eating chocolates, meringues and sweets with a slice of cake!!! 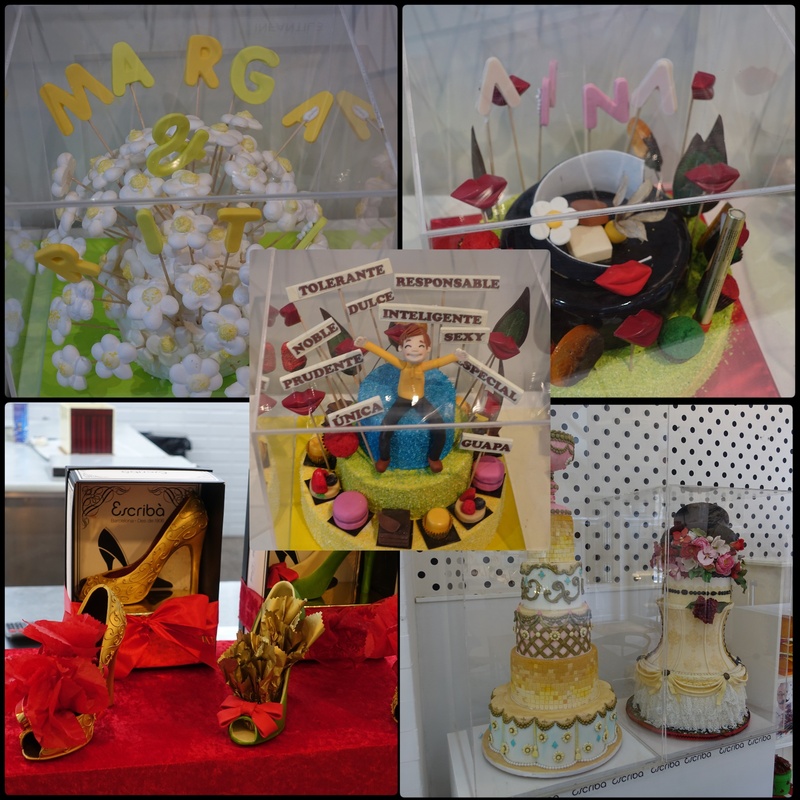 And what a lovely idea to use quality chocolates and homemade treats like the ones Escribà provided at the workshop. Thank you Cooking the Chef for this interesting experience and I admire Christian Escribà’s style. 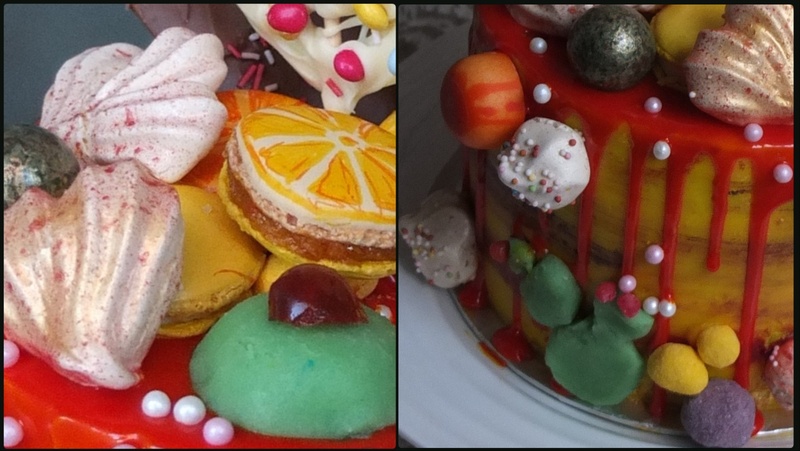 Went to his Gran Via pâtisserie recently with mum and took photos of his cakes for inspiration. You can see more Escribà-inspired recipes from the group at the Cooking the Chef website. And here’s my Sicilian sunshine lemon citrus drip cake again. A bit of a marathon but fun and there’s stuff left over to decorate another drip cake!!!! 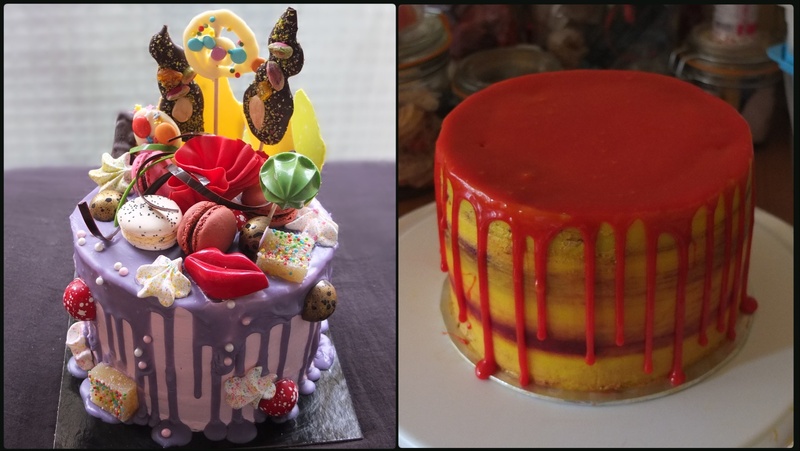 What would you put on your drip cake? It is so whimsical and lovely! No podía dejar de leer y de ver tus fotos. Una receta super elaborada. Tantas preparaciones, tantos ingredientes y acabados. Me he quedado alucinada. Una maravilla, enhorabuena. Puedes estar orgullosa de tu tarta seguro que al señor Escribà le encantaría. Menudo trabajo has hecho. Beso. Huau…I’m impressed. Lovely cake, lovely effort to be part of the challenge. Good, good and cool job. Sure, that Christian and all his team, will be happy with your colaboration. And all this sutff about Sicily…. Thanks a lot Lili! Lilli, you have made an incredible work of art and I confess, I love the yellow color!